WEARING: Melissa Araujo Duster, BC Label Slip Dress, A.P.C Half Moon Bag, THP Shop Cuffs, Celine Sunglasses and Tibi Mules. The understated duster has long been an essential staple in my wardrobe, so much so that I decided to make one for my new collection (coming soon). 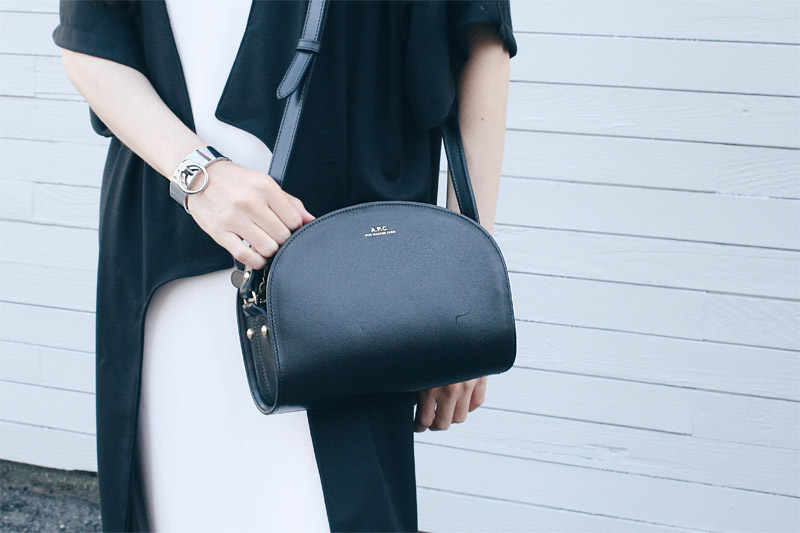 Incredibly useful for layering year round, it encapsulates minimal style for me: simple, sleek and ultimately timeless. Here I wore it with another easy piece of the moment: the slip dress, paired with minimal accessories for that effortless style edge. My new collection will have simple but strong silhouettes, with clean lines and some daring cut-outs. I am still in Paris (these photos were taken the day before I left to Europe), oh the grand spectacle that is Paris Fashion Week. I am loving every moment, be sure to check my Instagram and Insta stories here to see what I am up too. I will soon have blog posts about Paris, PFW and more. Everywhere you go here is a treasure of culture and fashion delight. Lovely outfit dear! Such a beautiful and elegant layering, great lines! So so gorgeous, Melissa! Love the elegant layering!